Mother’s Day (and Father’s Day!) is one Hallmark Holiday I have always appreciated even before I myself had anyone calling me Mommy. Everyone knows in some capacity the limitless dedication involved in parenting no matter which side of that relationship you are on! This Mother’s Day 2015 was especially treasurable because it is the first time my parents, sister and her family, and my own family were able to celebrate together. After much deliberation due to dietary preferences and menu options, we chose to have breakfast at Another Broken Egg Cafe. It was so nice to sit around a table, breaking open hot beignets, and having conversation on various topics. The Mediterranean style potatoes were such a hit that we ordered more. Well, all of that kept us full for most of the day! As dinner time approached, my family asked me what I wanted for dinner. I was wanting a sandwich which led me to think of my favorite types of bread, sandwiches, and chips as well as considering budget (my birthday was 2 days prior so we had been doing a lot of celebrating already! ), health, and creativity. White bread doesn’t make it into our house often but when it does, it is often in the form of a local sourdough with minimal ingredients. It was this post by my friend and fave blogger, that convinced me! I decided on a caprese type sandwich with sweet potato chips. The family went out to get the bread, fresh mozzarella, and chips. 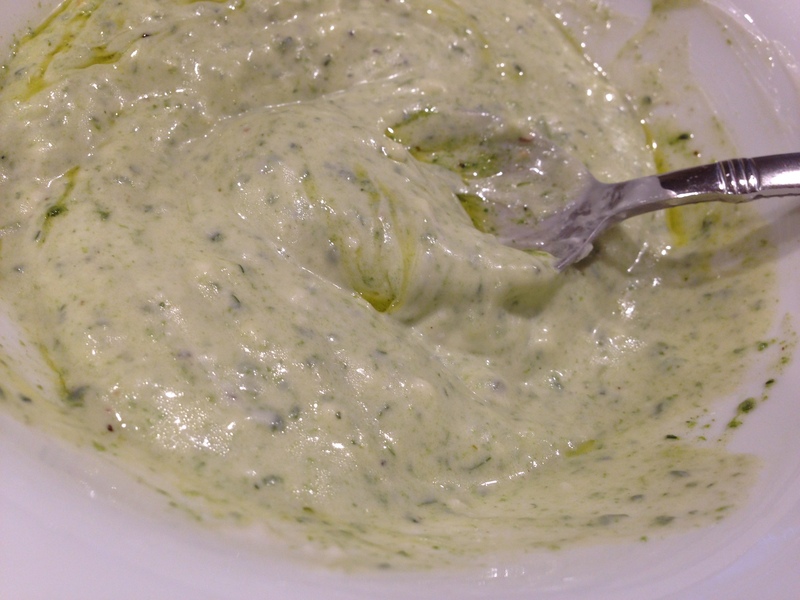 I whipped up a basil aioli. When I don’t have or don’t want to purchase a big bunch of fresh basil, I use these convenient little frozen herb cubes. They melt in seconds in a hot pan or in minutes at room temperature. 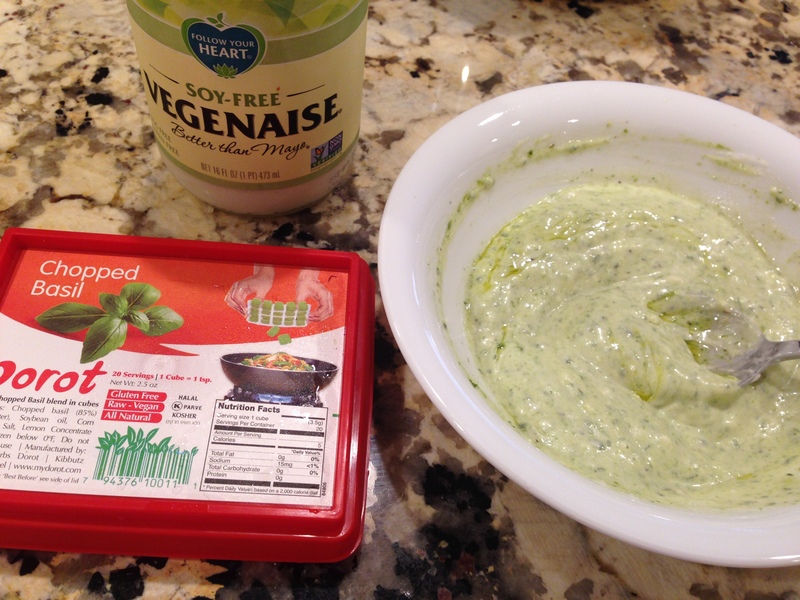 I mixed a few with some vegan mayo, salt, pepper, and squeeze of half a lemon. 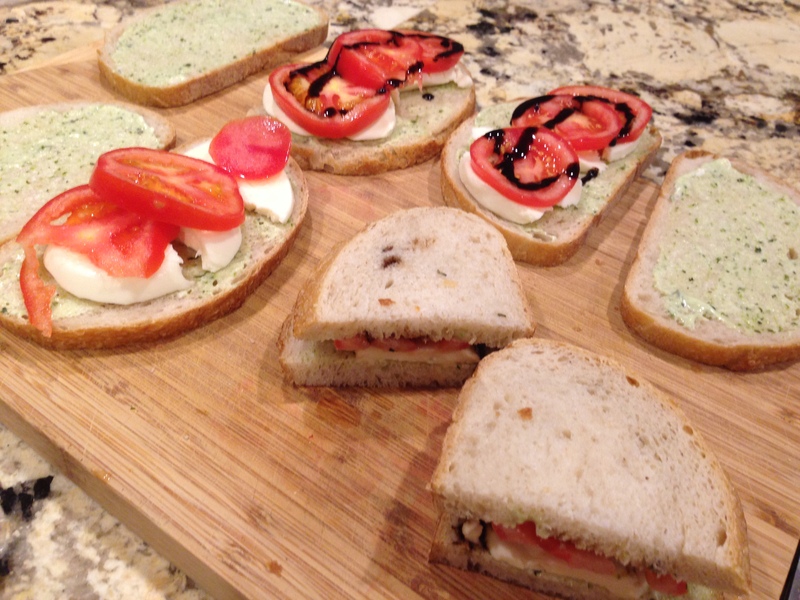 It provided the basil flavor you need for a proper caprese and worked well as a condiment. Sliced up some tomatoes, the fresh mozzarella, layered on baby spinach both for the pretty green visual to complete the caprese look, and squeezed on a little reduced balsamic vinegar. The below are estimations. It is a very versatile recipe and your preference may be more or less of one ingredient or another, but this should make 4-5 sandwiches! 1 loaf bread of choice. This recipe would be delicious on Italian bread or a baguette too as well as a tortilla wrap! Mix the first 5 ingredients together to make the aioli. Spread onto 2 slices of bread and layer on tomatoes, cheese, greens, and balsamic vinegar and or drizzle of olive oil if preferred. Assemble and dig in! A very lovely menu for this kind of special family day. My wife and I tried it at home on a regular day and enjoyed it immensely.